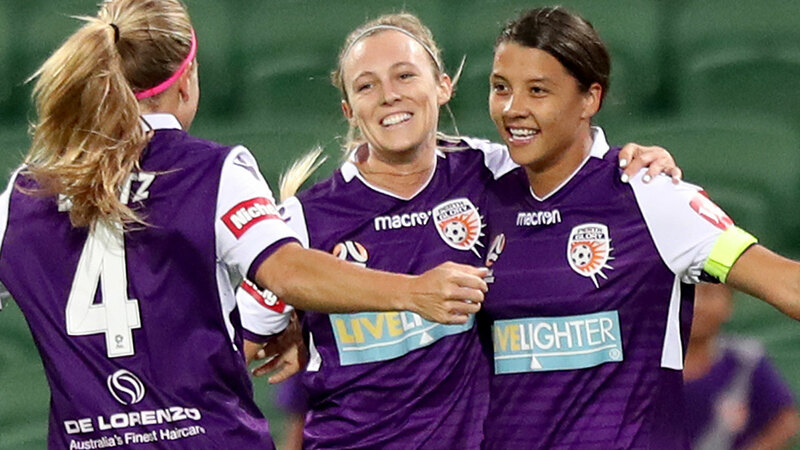 The W-League's marquee player Sam Kerr has shown her stellar best by scoring twice and setting up another two to lead Perth Glory to an action-packed 5-2 home win over three-time reigning champions Melbourne City at nib Stadium. The win keeps Perth in second behind surprise leaders Melbourne Victory, while City sit second-from-bottom after a third defeat in four outings. Kerr set the tone after ten minutes by scoring a goal of the season contender with a thumping finish from the edge of the penalty, having run with the ball from her own half. The Matildas star then set up fellow forward Rachel Hill for the Glory's second 11 minutes later amid another fast-paced attacking move. Elise Kellond-Knight got City on the board soon after the break with her thumping free kick lifting the visitors back into the contest. However, Kerr struck back almost immediately with the help of a deflection, and would have had a hat-trick only for her volleyed finish to be ruled by the slimmest of offside calls. A City side missing key defenders Steph Catley (injured) and New Zealander Rebekah Stott (international duty) were torn apart on numerous occasions, and it is was no surprise when Alyssa Mautz added a fourth. Kellond-Knight again pulled a goal back, this time from the penalty spot, and Glory goalkeeper Eliza Campbell was called into action on numerous occasions, notably making a spectacular block from Rhali Dobson. Kerr teed up Mautz to score her second and add Glory's fifth with virtually the last kick of the match. That goal ensured a record club defeat for City, with the only bright spot being the return of Kyah Simon from injury for her first start of the season. "The whole team is doing well, not just the front three, but still plenty to work on," said Kerr. "Home games like this in Perth are why I came back to the W-League."